In the early days of Stephenson, as Rock Island was then known, there was a single Presbyterian congregation, which didn’t even have its own church building. By 1837, slavery issues divided the congregation into two groups. One calling itself First Presbyterian built a new church just west of the courthouse. A bit later, in 1845, the remaining congregation built Second Presbyterian Church just north of the courthouse. In that same era, the two churches cooperated to establish a mission school they called Greenbush Chapel in the hillside woods near 27th Street and 8th Avenue. Pictures show it as a small 1-½ story frame building with a gable roof, looking much like a modern garage. 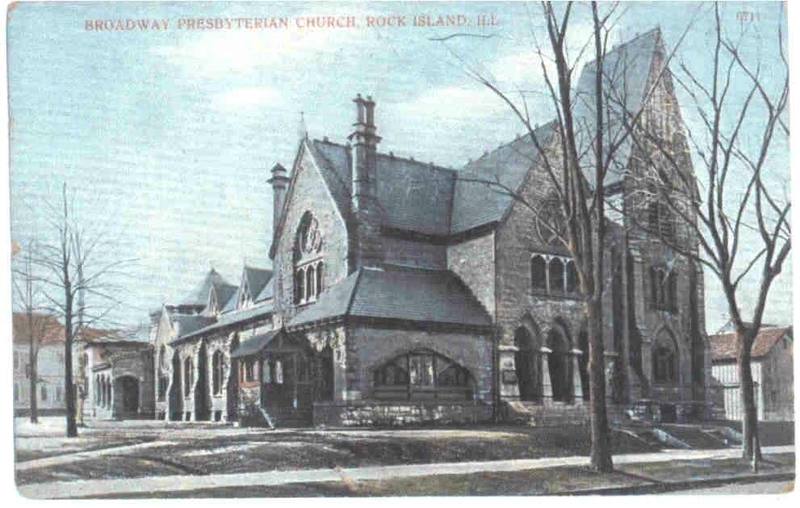 After slavery issues had been laid to rest by the Civil War, the two congregations once again united in 1870, calling themselves the Presbyterian Church of Rock Island and meeting in the Second Presbyterian Church building. The First Presbyterian building was sold to St. Joseph’s Catholic Church for $9000. Soon after the merger, there was a second division, this time for geographic reasons: A church was needed in the eastern part of the city. Reportedly there was discussion among the eastern group as to whether they should form a Presbyterian or a Congregational church, with Presbyterian being the final choice. In May of 1875, their first service was held at the Greenbush Chapel which previously had been virtually abandoned. Only a month afterward the ground was broken on the corner of Spencer and Broadway streets for a fine new church building. Although the street names were changed to 7th Avenue and 23rd Streets the following year, the church has kept its original name of Broadway Presbyterian to the present day. The cornerstone, said to be Joliet limestone, was laid on May 2, 1876. Its contents included local histories, newspapers, and one unexpected item – a picture of the Philadelphia Centennial Exposition buildings. The church structure itself appears to be of the Joliet stone, a sturdy, yellowish dolomitic limestone cut from quarries along the Des Plaines River. Joliet stone was also used for some of the Rock Island Arsenal buildings. Formal dedication was held on November 3, 1878. 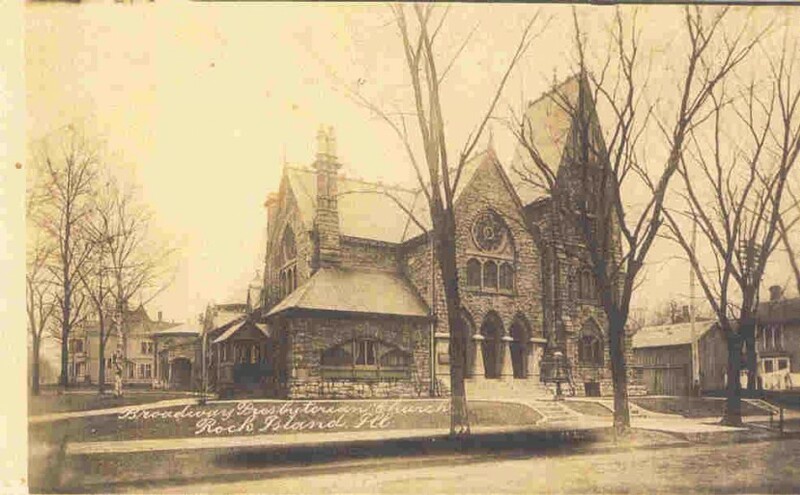 In 1895, expansion at the rear of the church created Sunday school rooms and in 1920, after this postcard picture was taken, there was yet another enlargement at the southwest corner. Our real photo featured postcard from Shannon Hall’s collection shows the original appearance of the main entrance of the church, framed by vase-shaped elms along 7th Avenue. Although postmarked in 1918, the photo was made before 1914, when the Christian Science church on 22nd Street was built, since its dome is visible from the same angle today. Note the house at the far left, which was demolished to create the current parking lot. Damage was total in the sanctuary, where the fire started, but both the rear and front of the church sustained less damage. For four months, until the Sunday school area was repaired enough for use, the congregation met in temporary facilities at the nearby Lincoln School and Knox Mortuary. Architect William Stuhr designed the reconstruction of the devastated church, which was completed in 1950 by Tunnicliff Construction Company. The project changed the orientation of the sanctuary and relocated the main entrance. By 1955, additional restoration within the church parlors and school was completed. A more recent addition housing a new elevator was constructed of Anamosa limestone from Stone City, Iowa, laid in the same random ashlar pattern. Designed by Shive-Hattery, it provides easy access to all areas of this historic church, ensuring its adaptability into the next millenium. This article, by Diane Oestreich, was originally published in the Rock Island Argus and Moline Dispatch on January 5, 2003.